I am a coffee junkie. I can't seem to function without caffeine and I need a cup or two to jump start my day. However, drinking it on a regular basis has made my pearly whites... well, not white. And it definitely made me more conscious when I smile or talk to people. I've considered availing of teeth whitening services but reading about its adverse effects scared me. Thankfully, with new technology came a solution that made me feel it was the right time to have my teeth whitened. 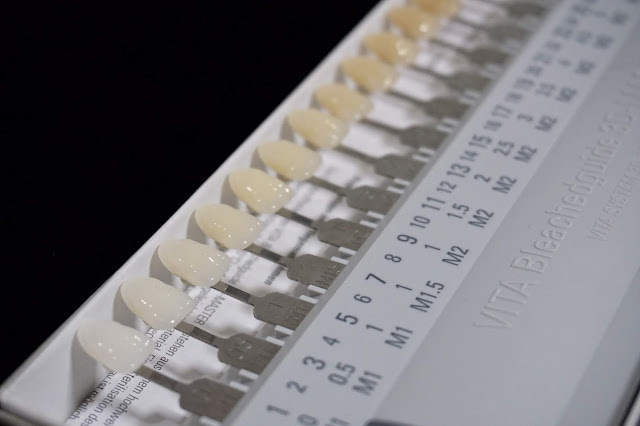 I was invited by SpectruMed to try out Y10 Brightonix, a revolutionary teeth whitening technology that sets a new standard in the oral care industry. 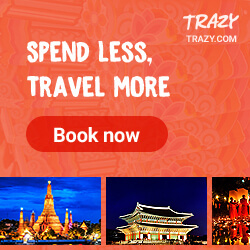 We all know that the process of teeth whitening is not a short journey. It takes several sessions before we achieve the shade we want. And Brightonix offers is a shorter period of time with its low power radio frequency in removing stains from teeth enamel. Aside from stain removal, this technology also rejuvenates the oral cavity. Before starting my session, I was asked to gargle to remove any possible food bits that could block the whitening process. I was then briefed on what will happen and how long the session will last. We then checked the shade of my teeth and I was at shade 11 prior to the session. Soon, the attendant put Y10 toothpaste on the ergonomic silicon mouthpiece. Note that the mouthpiece is no ordinary rubbery piece that holds the toothpaste. It has a bipolar structure that maintains the radio frequency (RF) wave's volume for a safer procedure. For all sessions, the RF current is generated at 7MHz, a high frequency wave which cannot penetrate internal tissue and cause any damage to oral cavity. 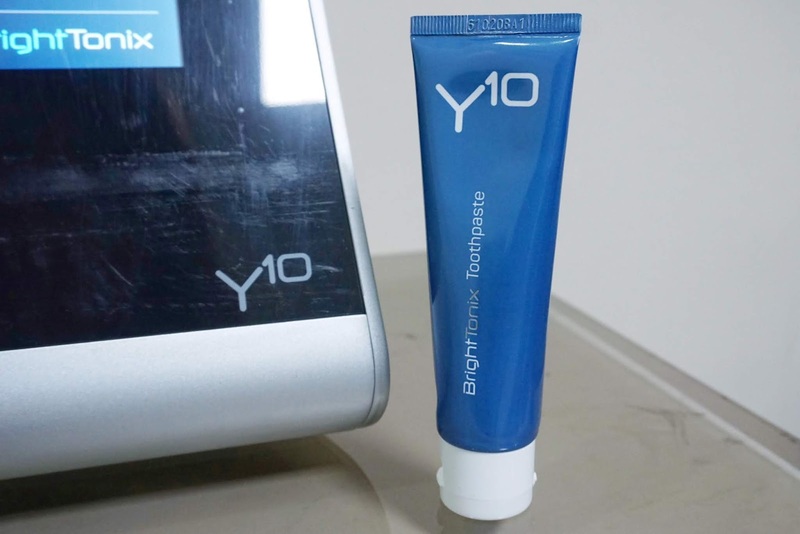 The Y10 toothpaste is made of ingredients such as Hyaluronic Acid which is clinically proven to promote anti-aging of the oral cavity; Potassium Nitrate, a compound efficient in reducing discomfort of sensitive teeth; and Sodium Flouride, a common ingredient in toothpaste to keep teeth strong. A session lasts for 30 minutes and it would be a great time to catch up on that Netflix series you've been watching while waiting for the treatment to end. Half an hour would feel a lot longer if you do not have anything to watch or read. So best to come prepared. 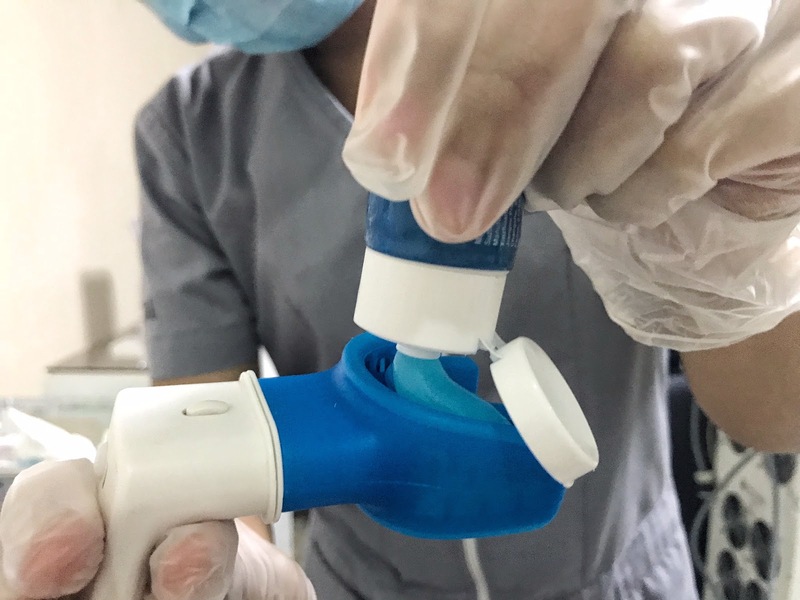 After the session, the mouthpiece was gently removed from my mouth and I was asked to rinse. And my mouth felt very clean (and minty). And the best part is that my teeth's color got several shades lighter! From 11, I was down to 7 in just one session. Just imagine how fast I could get to shade 1 with just a few more sessions. Though of course that would also mean giving up coffee, tea and soda. But it's a small sacrifice to have that perfect smile. Want to try Y10 Teeth Whitening as well? Contact Center for Advanced Dentistry for price inquiry and appointment.